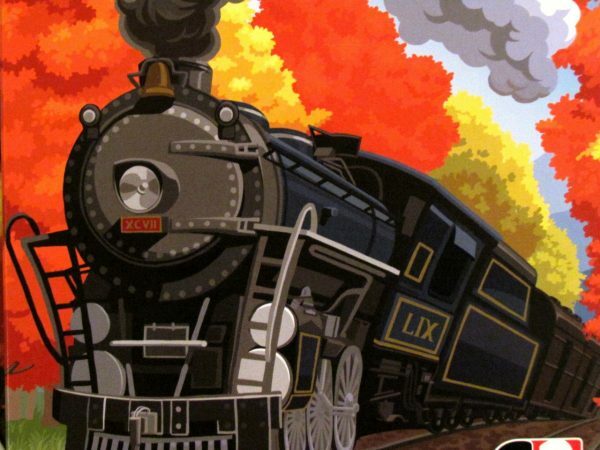 I’ve always wanted to own a locomotive. But only now, thirty years later, I finally succeeded. And I got even extra five wagons to it. I will always have them connected with me and be a true engine driver. This is called a dream come true! 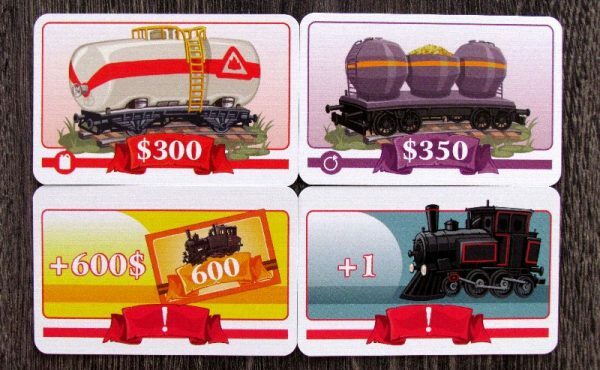 And all the players, who love railroad, will be wishing upon boardgame Take a Train. It was created by a pair of Polish authors Violetta Kijowski and Marcin Ropek and their joint efforts were crowned by publishing of the game by G3 company. 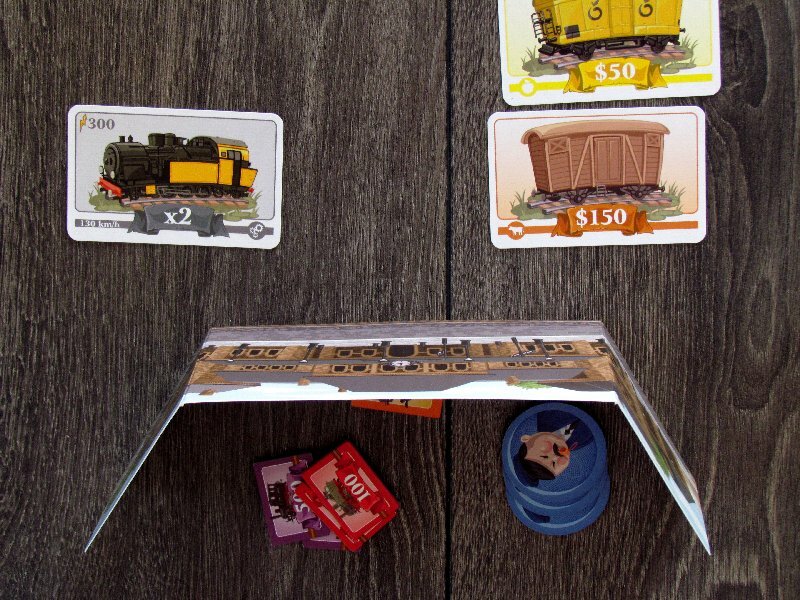 Only a bit larger than small box shows us a train as it chases through a blooming landscape. We will not somehow hesitate unnecessarily long to accept the invitation to one of the rides. 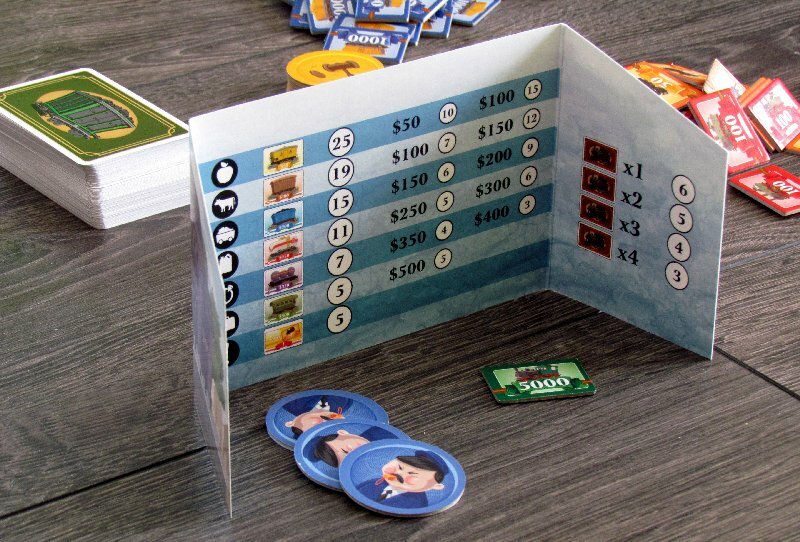 Looking into inside of the package, there can be found a set of large screens of thick paper with a list of rules on the inner side. 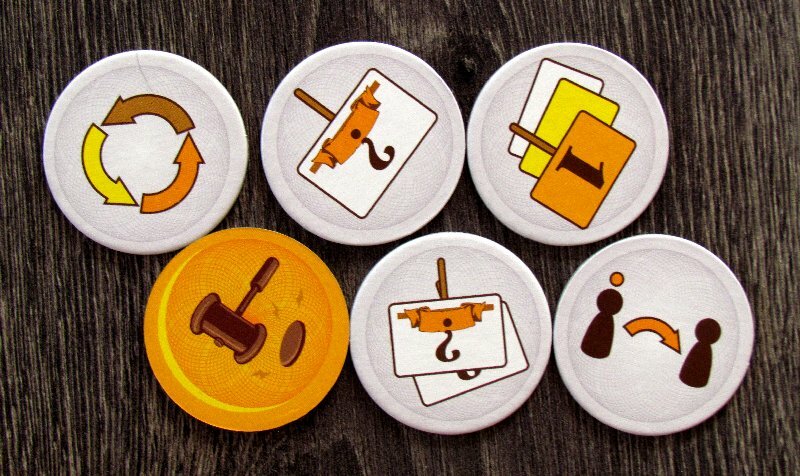 Important are certainly also tokens. Most of them are cardboard banknotes (of five denominations). 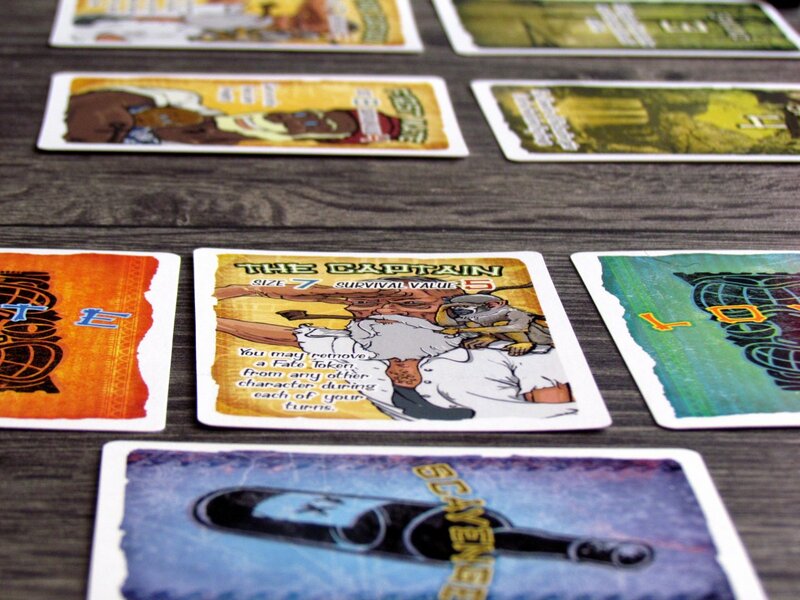 The main, however, are cards. 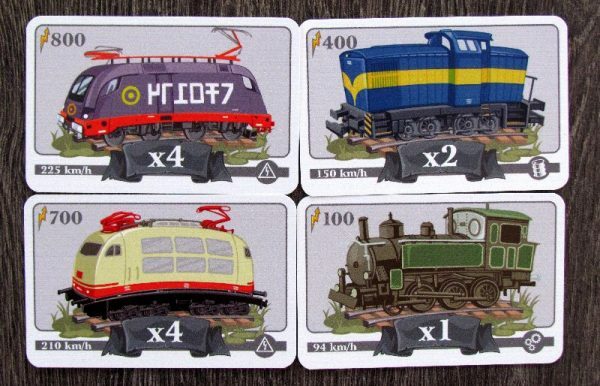 There is altogether 105 of those and can be split between different locomotives (18) and cars with different cargo (87). At the beginning of the game, players will get their starting finance in the form of five thousand dollars. To do this, select your color, take a screen and hide banknotes behind it. 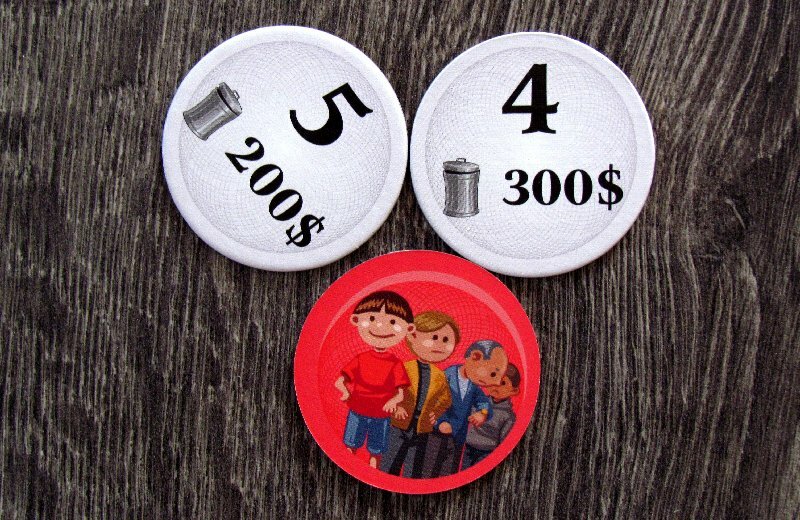 Each player will also receive three purpose tokens. 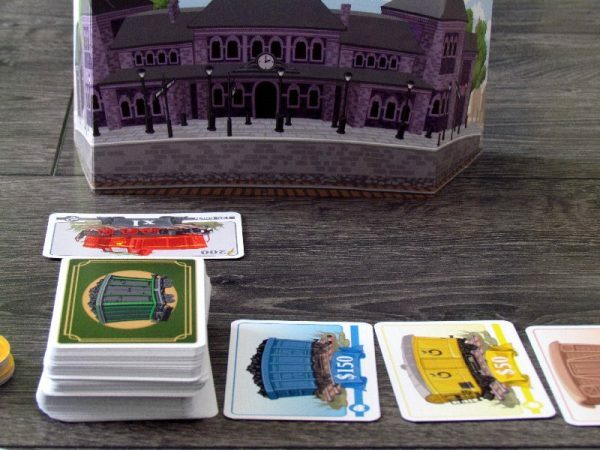 Number of locomotives in the package is adjusted according to the number of participants in the game. 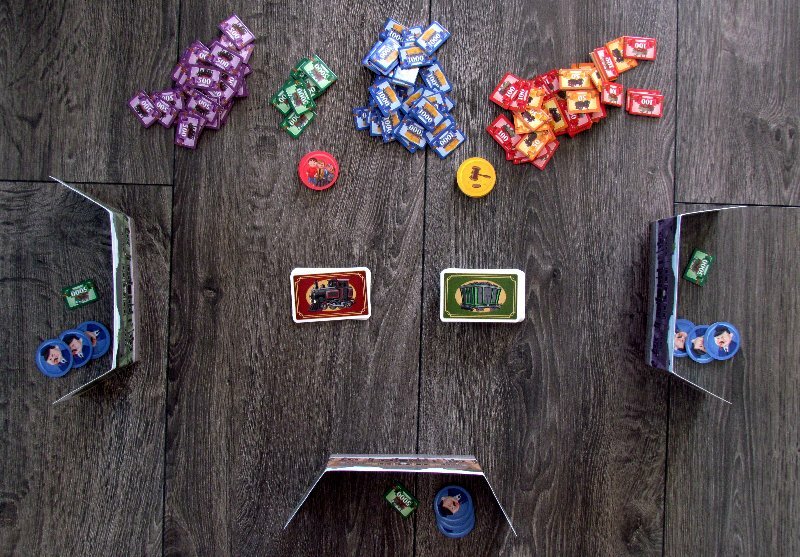 Both decks will be, as well as tokens, placed at start in the middle of the table, making an offer. 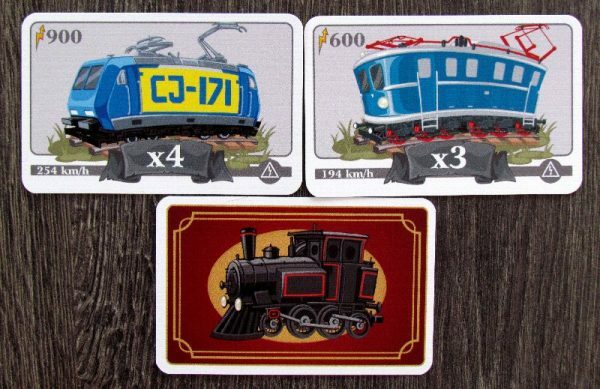 Each of the three rounds will start by auctioning for locomotives. But it will not be always the same auction, but its type is decided randomly by drawing a token. 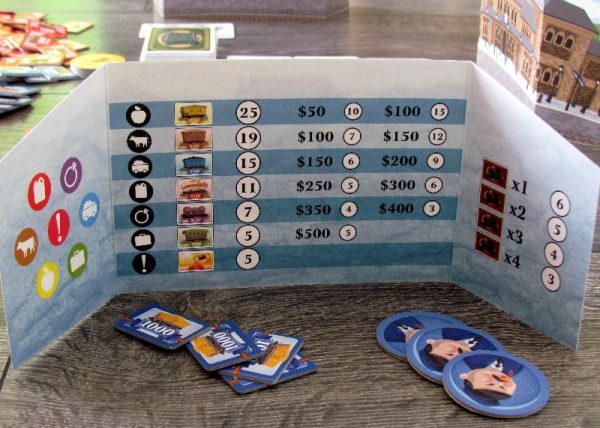 Apart from classical bidding, players can experience also for example blind auction. 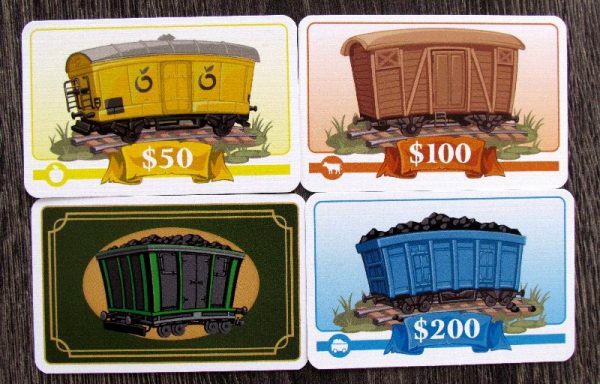 Auctions take place until each participant has three locomotives in his possession and has paid at least its starting price (according to the power at lightning icon). In the event, that anyone has run out of funds sooner, they get machines, that nobody else wants. Value of such gained locomites also decides about order for the second phase of the game. Players create wagons offer (by revealing some of them from shuffled deck). From that moment, players will alternate in making choices, but also have the opportunity to pass or sacrifice whole turn to replace the entire offer. 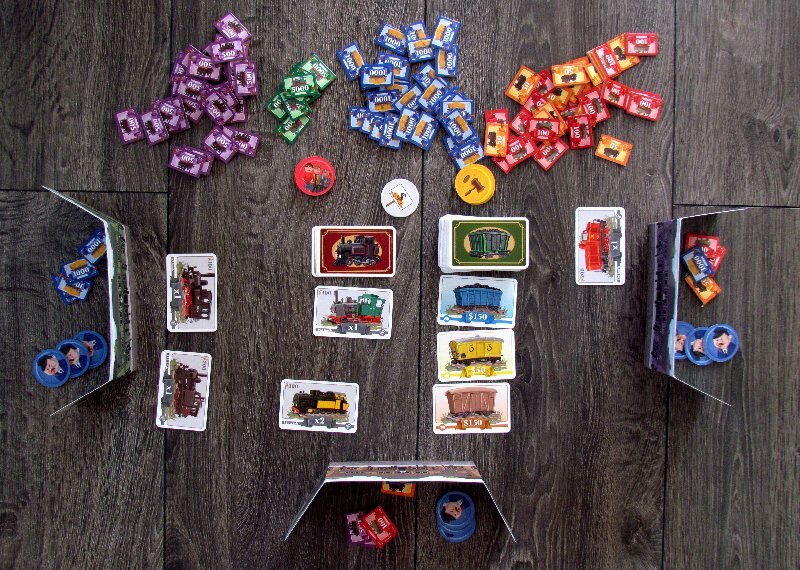 But if the player chooses one of several wagons, he immediately connects it to his locomotive. 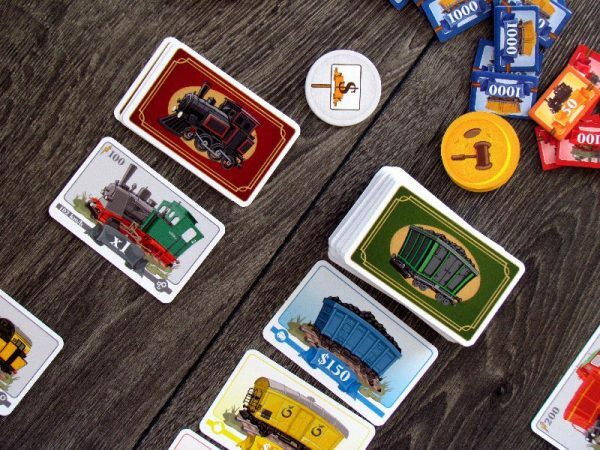 Not every train can hold any wagon – each locomotive may be dragging only one type of resource and player should not have same typ of cards connected to two of his machines. Picked up wagon is immediately replaced by new card. 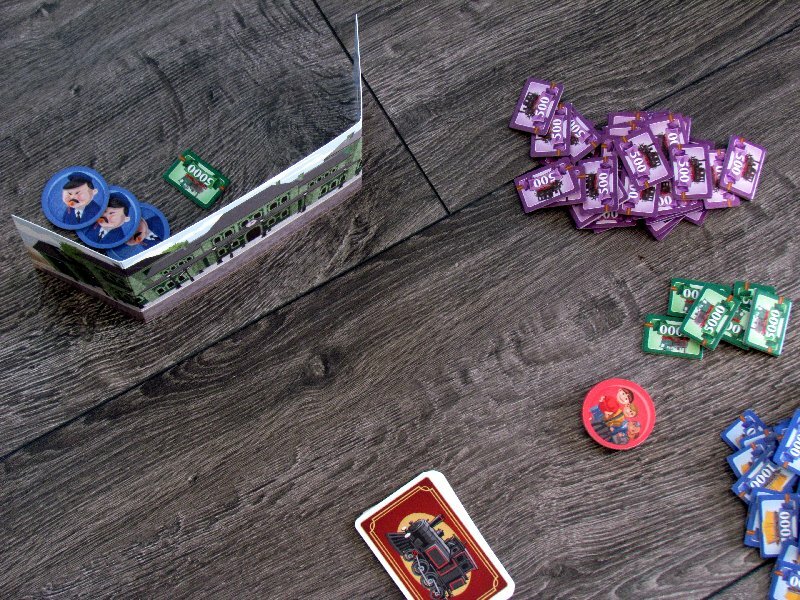 Players buy and exchange cards until the moment, when there is nothing left to add. Then, players add up values of points and multiply it always by strength of locomotive dragging it. 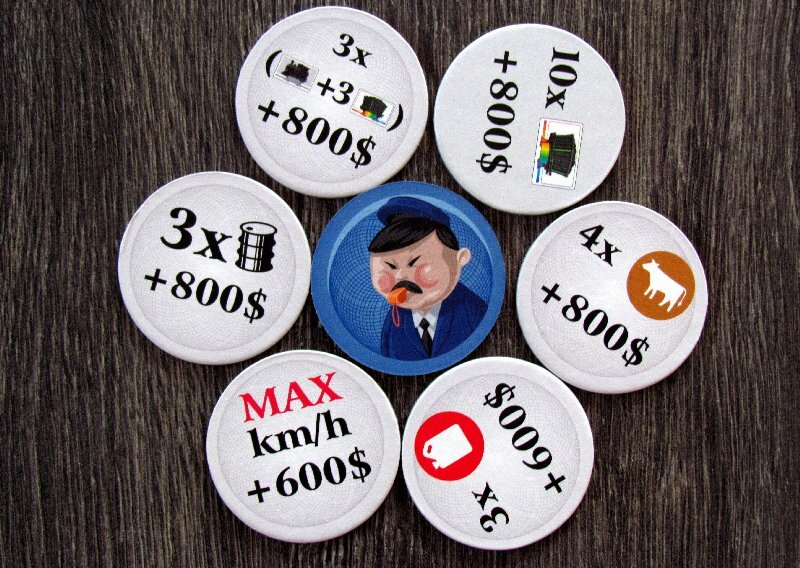 Result is a profit, player gets from the bank. 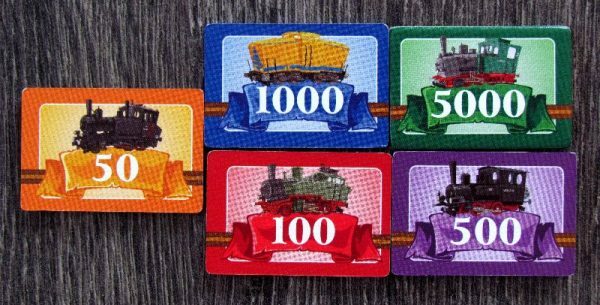 All locomotives are then returned to their decks and players may slug it out from scratch with a new machine auctions. After the third round, its all over. 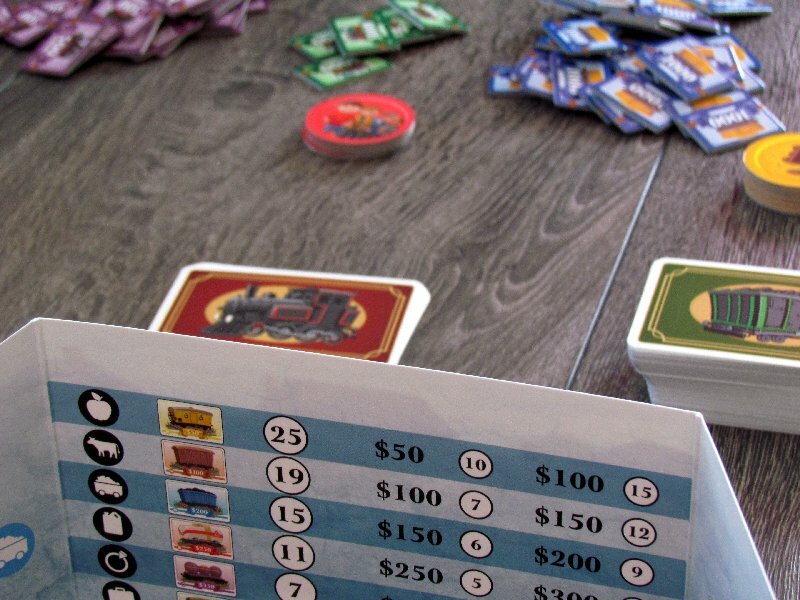 Players add up their finances, and whoever has the most, is the winner. Take a Train revolves around auctions, which will determine the direction of each round. 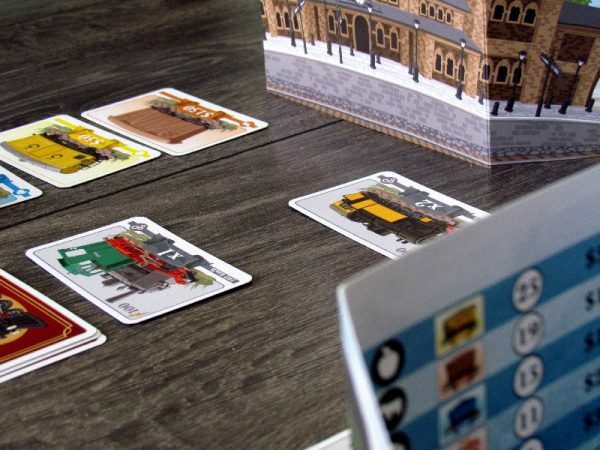 Players can compete for locomotives in a different way. Second phase then depends a little on luck and current offer, because player must be at the right time in the right place. This will provide him with the appropriate wagons and also a big profit. Unfortunately, it’s done by multiplication. The overall scoring method speaks strongly against the actual theme. Determining profit by multiplying locomotive power by value of its cars might work in the game, but it does not sound even a little logical. From this perspective, the game is quite untrustworthy. It is therefore focusing only on earnings and card management. We like choice of auctions. From classical bidding for specific card, you will go ahead and bid in a closed fist or without even knowing the card you will get. But there is also a twist in the form of auction inspired by classical draft. 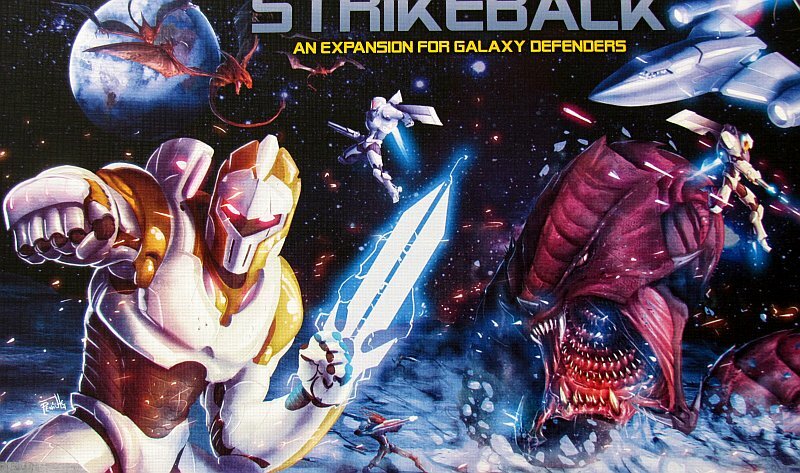 Certainly positive news is, that due to its financial focus, game does not take an extremely long time. Each round needs around ten minutes, so in the end you get to a solid half hour. All this only if you are playing in a lower number of opponents, because up to six railwaymen may participate . This can mean twice the length, but mostly seems overly dull and no-fun rounds. 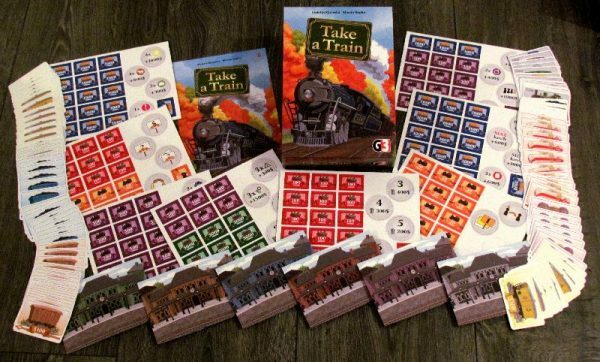 Take the Train is definitely not a game, that we would somehow like to play again. Quite the contrary, individual matches look like copies over carbon paper, which has only one clear result – boredom. And you will not want to even begin next one. Take a Train is a game, that lacks the main thing – fun gameplay. 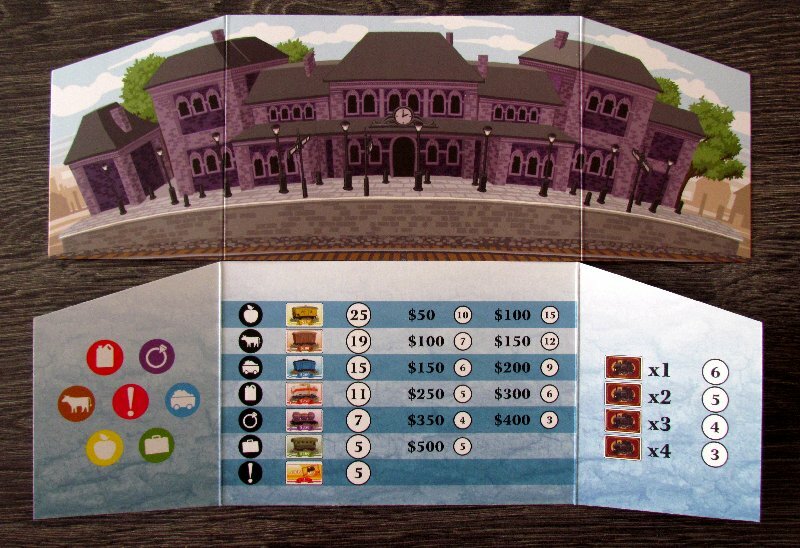 Take a Train is a game focused on the financial success, that you play once and then it becomes forgotten. 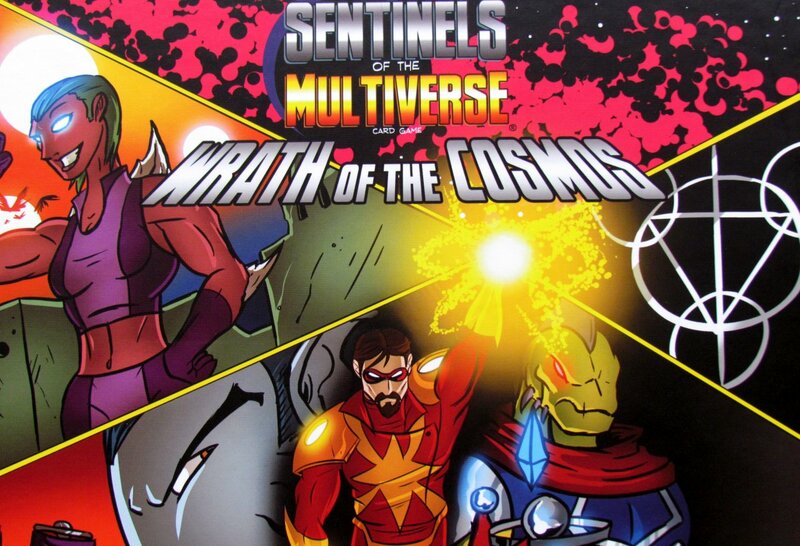 It offers no positive experience, but only collecting cards and effort to put them together into sets. But its all made in a dry manner. Only different auction at the beginning of the turn make it a little more interesting, but all fun drowns in finding the right cards. Overall impression is similar does not fit train theme at all, because scoring is truly strange. Take a Train is not a game, which you should long to play again.